Currently, Some Wealthy Individuals Can’t Make Campaign Contributions At The State Level in Michigan Because Of Their Financial Interests In Michigan’s Casinos. They Could Begin Having The Power To Give If A Push In The Legislature Is Successful. LANSING (March 12, 2019) — Michigan’s 21-year-old ban on campaign contributions from individuals with financial interests in the state’s casino industry would be no more if some lawmakers get their way. The change could allow a handful of wealthy individuals who currently fall under the ban, like Quicken Loans Chair Dan Gilbert and Little Caesars co-founder Marian Ilitch, to begin writing checks to state-level campaigns. 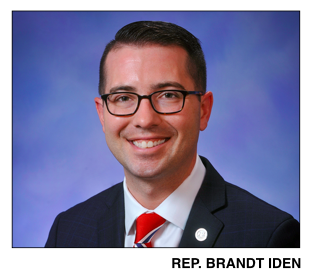 Current lawmakers, including Rep. Brandt Iden, a Republican from Oshtemo Township, argue that their predecessors went too far. “Really, when I look at it, I think it made the assumption that casino owners were criminals,” Iden said in an interview after a committee meeting last week. Those in favor of doing away with the contribution ban need three-fourths of the lawmakers in the House and the Senate to vote with them in order to be successful. That’s because the law that includes the ban was originally put in place through a voter-approved proposal. During the 2018 lame-duck session, a bipartisan group of lawmakers considered eliminating the ban as part of negotiations over a package of changes to the state’s gaming law. Ultimately, enough Republicans and Democrats spoke out in opposition to lifting the contribution ban, and lawmakers left the change out of the package they approved in the final hours of the 2018 session. Then-Gov. Rick Snyder vetoed the package because of other issues. 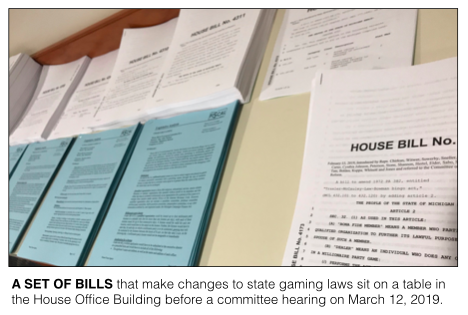 Now, lawmakers are preparing another push to change the state’s gaming law, and lifting the contribution ban is part of the package that’s been introduced, Iden said last week. Iden noted that individuals with investments in Michigan’s casinos already can make contributions to federal candidates, those running for U.S. House, U.S. Senate and president. “It really does create a disparity between what can happen here at the state level and what can happen at the federal level,” Iden said. But some lawmakers are hesitant to go along. They don’t like the idea of allowing more money into state politics. And some are worried that the change is meant to specifically help a few wealthy Michiganders have even more influence. Rep. Yousef Rabhi, a Democrat from Ann Arbor, said the change could be aimed at Gilbert, who’s championed reforming the state’s auto insurance laws in recent years. While Gilbert is selling Greektown Casino, current law bans those with casino licenses from making contributions for three years after the license is terminated. It’s unclear whether that three-year ban would specifically impact Gilbert’s situation. Gilbert and his wife, Jennifer, made $1.9 million in campaign contributions at the federal level during the 2016 election cycle, according to campaign finance disclosures. But he couldn’t give direct contributions to candidates for state offices, like the Legislature or governor in Michigan. Iden noted that Gilbert is selling the casino, has invested heavily in the state and is already involved in the state’s political process. “I don’t think that it’s necessarily fair to penalize him,” Iden said. Gilbert has publicly floated the idea of running a ballot proposal in 2020 to change the state’s auto insurance laws if the Legislature fails to act as reported by Crain’s Detroit Business. The current ban on campaign contributions from those financially interested in casinos doesn’t affect giving to ballot proposal campaigns. Michigan voters originally approved the Michigan Gaming Control & Revenue Act to allow for the three Detroit casinos through a statewide vote in 1996. In 1997, lawmakers expanded the act’s restrictions. Under the expanded law, banned contributions included donations directly to candidates, to political parties and to independent PACs. 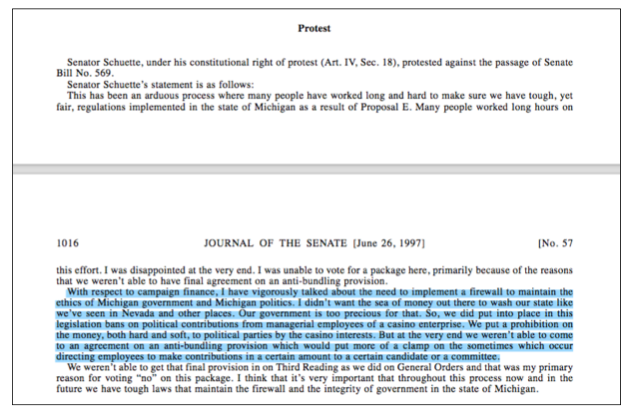 Then-state Sen. Bill Schuette, who went on to be the state’s attorney general and was the Republican nominee for governor in 2018, touted the ban in a statement in the official Senate journal in 1997. At that time, he argued that the ban should be stronger. The law originally barred contributions by relatives of casino licensees, but that provision was deemed unconstitutional by former Attorney General Frank J. Kelley in a 1998 opinion. Kelley said the provision improperly restricted political expression. In the same opinion, Kelley upheld the ban on political giving by licensees, which he said directly aimed to prevent the appearance of corruption. It was current state Sen. Curtis Hertel Jr.’s father who asked Kelley to weigh in on the matter. The current Sen. Hertel is one of the Democrats in favor of lifting the ban. Hertel, a Democrat from Meridian Township, called the contribution ban “silly” because large players with financial interests in casinos can easily get around the ban by giving to nonprofit groups or other accounts that fall outside Michigan’s loose campaign finance regulations but still work to influence elections. Smaller players that are loosely involved in the casino industry may not be able to access other ways to spend politically, he said. He added that in light of recent court rulings that have given legal protections to spending to influence politics, there could be a constitutional problem with the ban as well. Sen. Jeremy Moss, a Democrat from Southfield, was a member of the House in 2018 and was involved in the negotiations over the gaming bills in lame duck. Moss said former Senate Majority Leader Arlan Meekhof, a Republican from West Olive, brought up for discussion the idea of ending the contribution ban. Amber McCann, a spokesperson for the Senate Republicans, said she understands that it was the gaming industry that wanted the law changed to permit campaign contributions. “But there was not support in the Senate Republican caucus last term to change the existing law,” McCann said in an email. There were lawmakers on both sides of the aisle who supported ending the ban and lawmakers on both sides who opposed ending it. Changing the contribution ban would have required heavy support from House Democrats to meet the three-fourths support requirement. “Ultimately, a decision was made that we weren’t going to touch this with this legislation,” Moss said of the lame-duck bill. Multiple Democrats said they would have to examine the entirety of the newly-introduced gaming bill to decide whether they support it. About 570 people or businesses are listed in the state’s “casino interest” database. You can access the database by clicking here.